With the growing demand for big data technologies for analytics and business decision, the demand for Hadoop distributions has also increased. Now companies prefer Hadoop distributions more over the custom clusters. When I say custom cluster that means the Hadoop cluster developed by the Hadoop Admin from scratch. This includes all the life cycle like building servers, installing Java and then installing Hadoop followed by Hadoop ecosystems. But that becomes a bit tough to handle due to the mess included. And so, companies prefer to go ahead with the top Hadoop distributions over the custom cluster. If you’re working on Hadoop in any company, you can relate to the situation. Most of the company have come across are either using Cloudera Hadoop distribution or HortonWorks Hadoop distributions followed by mapR. If you will see the top Hadoop cloud service providers, these companies are making the top positions due to their influence in the big data segment. Although there is no absolute winner when we say best Hadoop distributions as all have their pros and cons but still Cloudera, HortonWorks, and mapR are leading the segment. This list of Hadoop distributions is followed by some tier two products of IBM and Pivotal which are making an impact now. Most of these top Hadoop distributions companies are focusing on key enterprise features such as security, scale, integration, governance and performance. 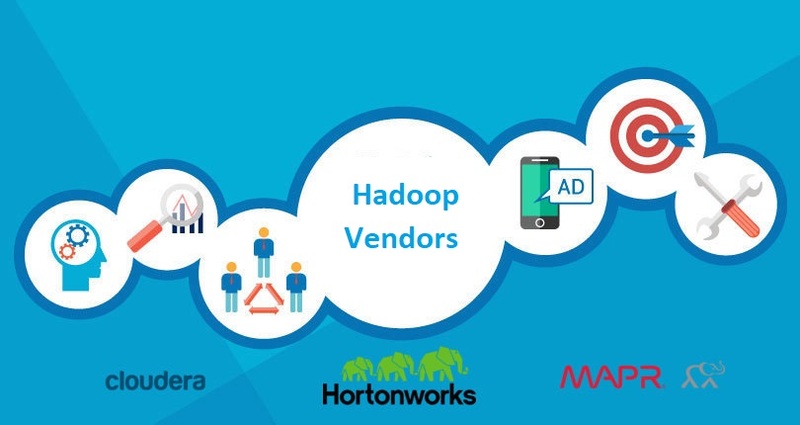 In this top Hadoop vendors post, we will be sharing 5 best Hadoop vendors which are enabling users to use Hadoop from their Hadoop distributions. If you will see the global Hadoop market forecast for 2020, the industry is crossing $50 Billion and many other Hadoop vendors will emerge to capture this market. 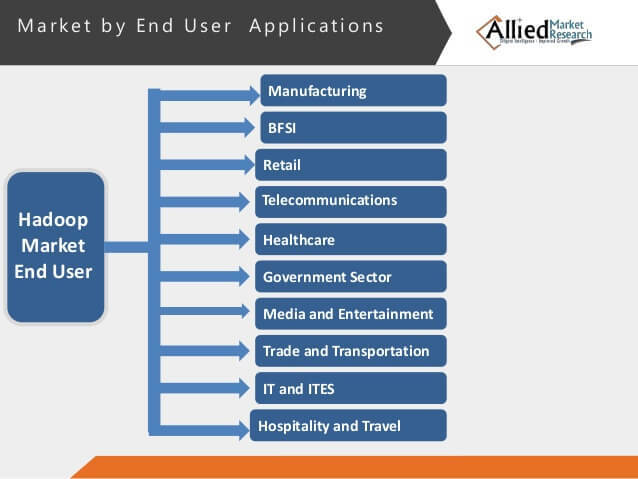 As per Allied market research, nowadays Hadoop is being used in almost all the industry for better predictions and market research. Here are some of the top sectors where it is being used on large scale. I was stunned when I heard a state government is having 3.25 petabyte of data which they are using to forecast for crimes and climate. This is the power of big data and a proper utilization of which can bring the positive impact for sure. We have also written some of the case studies, which you may want to refer to understand these industries in detail. Before moving ahead with the post of top Hadoop vendors, let’s see why Hadoop distributions needed? Why not companies are creating their own cluster and using it. 1 Why are Hadoop Distributions preferred over Custom Cluster? Why are Hadoop Distributions preferred over Custom Cluster? Well, there are a number of reasons behind this and here I will share few top reasons for the same. If you have ever tried to design Hadoop cluster there are several things you have to take care including scalability, availability, and security among the top. This is not that easy as it sounds to and so need of dedicated big data Hadoop distributions needed. Here are some of the reasons why companies prefer top Hadoop distributions over the custom cluster. Hadoop cluster installation and configuration is not an easy job. Many newbies who start with Hadoop get stuck in the Hadoop installation part only. And if you stuck at any point of time, you have very limited sources available to get your query resolved. But this is not the case with the Hadoop distributions. Their support teams are quite active and ready to help you, in any case, anytime. So, the company usually prefer Hadoop vendors for the cluster. If you have ever created a Hadoop cluster you must have experienced this issue. If you are designing your own cluster you will have to setup each ecosystem separately along with Java and servers. This is bit hectic work which companies doesn’t prefer now. And so, they more to some automated solution where all the eggs are in the same basket. Hadoop is known for the reliability and high availability and a single failure (if not handled) can cause a huge loss. That is the reason for every single issue or failure, we need to take care of it. But if you are working on your own developed cluster, getting resolution is a bit tough as not many resources are available and so companies prefer Hadoop vendors. Hadoop distributors ensure that your cluster is working perfectly and reliability is ensured. Let’s start with the 5 top Hadoop distributions available with us and see their features. We will also discuss the Hadoop distributions pros and cons for better understanding. I am personally a big fan of Hadoop Cloudera distribution and HortonWorks distributions. These two I have used and can say, they are best Hadoop vendors in the market. Cloudera is one of the oldest Hadoop distributions available in the market and the most trusted as well. Their certifications are globally trusted and every Hadoop developers’ dream. Cloudera started their journey in 2008 from Palo Alto, California and provides Apache Hadoop-based software, support and services, and training to business customers. They have the operation worldwide and is a NYSE listed company. With a total Cloudera Hadoop distribution market valuation of $4.1 Billion, current Cloudera is leading the Hadoop market segment. Cloudera provides a solution for Hadoop, Machine Learning, and Analytics. Companies like Cisco, SanDisk, MasterCard, etc. are using Cloudera Hadoop distributions for their production work. 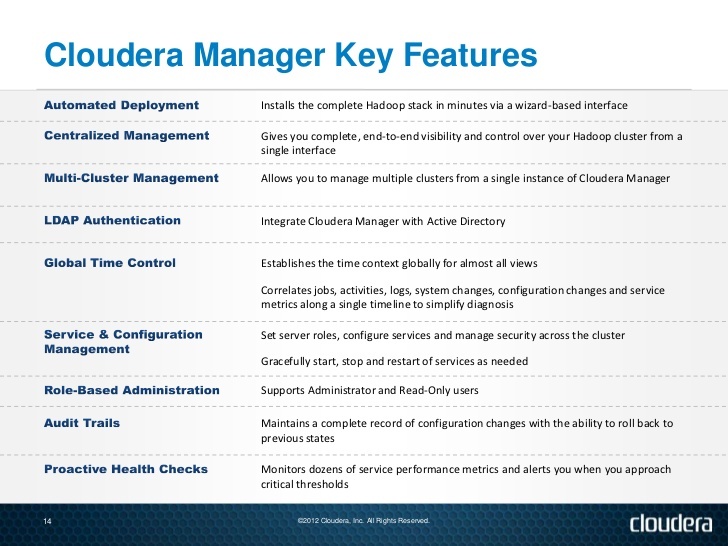 The latest version of Cloudera Manager is 5.11 and company keep on updating it. You can also start with Cloudera for free for personal use. Just install Cloudera VM and install it and start working. HortonWorks is another leading Hadoop distribution available in the market. Within the very short span of time, they have captured a greater part of the market. HortonWorks started their journey in 2011 from Santa Clara, California, United States. It is a NASDAQ (HDP) listed company provides solution globally in Hadoop and Analytics field. Before making to the IPO, HortonWorks was evaluated at $1.38 Billion which is far less than Cloudera but the way they are progressing very soon seems to give a healthy fight. HortonWorks provides various products in the data center, sandbox, and cloud. Fortune 500 companies like Samsung, Spotify, Bloomberg, and eBay are using HortonWorks Hadoop distributions. You can download HDP and start using HortonWorks Hadoop distribution for free for personal use. HortonWorks also provides certifications which are globally trusted. Together with Cloudera and HortonWorks, mapR is the top Hadoop distributions available and choice for the corporates. Started in 2009 from San Jose, California, United States, currently, they are operated from 10 different locations providing solution globally. So far mapR has raised $194 million from the market and is planning to go IPO soon. MapR is another leading Hadoop vendor providing Hadoop distribution for big data Hadoop, data analytics, and insights. They too offer Hadoop Certifications and is well accepted in the market. 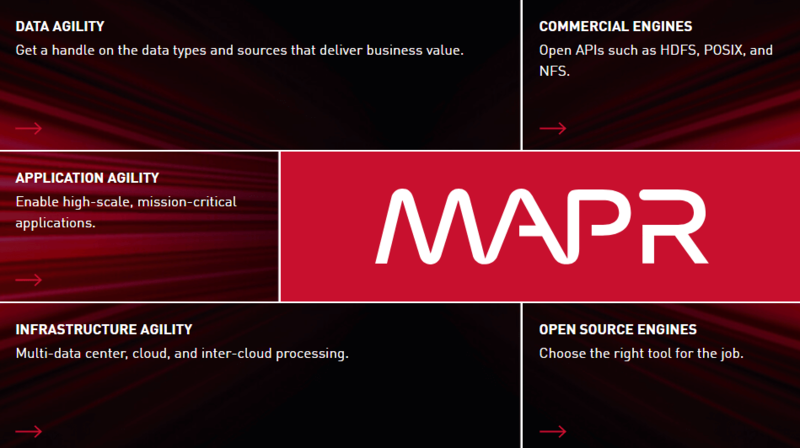 MapR is also a leading Hadoop cloud service provider. IBM Infosphere BigInsights Hadoop Distribution is also an industry standard Hadoop distribution combined with IBM cloud products. IBM provides BigSheets and BigInsights as a service via its SmartCloud Enterprise Infrastructure. It is comparatively fast and you can easily setup the cluster and push the data in next 30 minutes with 60 cents per Hadoop cluster, per hour. As per the market research firm, Forrester Microsoft Azure’s HDInsight has been rated 4/5 while Cloudera and HortonWorks securing 5/5. Although Microsoft is not known for the open source software but by looking at the potential and popularity of Hadoop, they have come up with HDInsight which supports Windows platform. 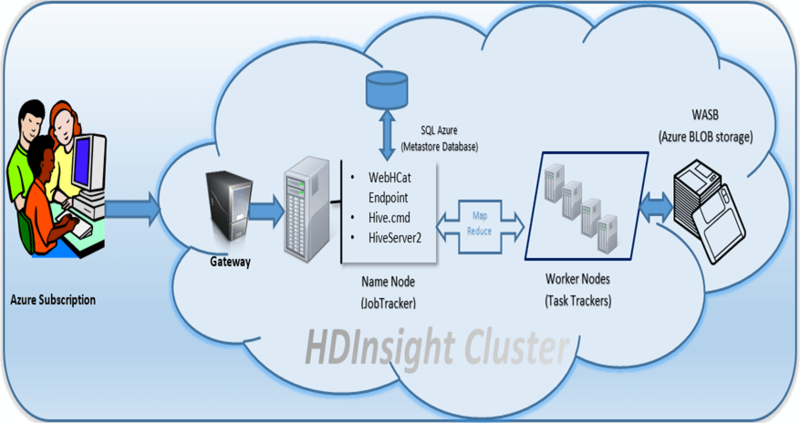 It runs with majorly two public products- Windows Azure’s HDInsight particularly developed to run on Azure. 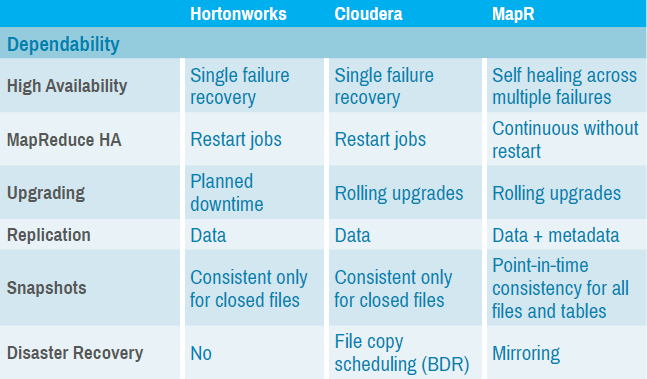 Let’s see few differences between Cloudera, HortonWorks, and mapR the leading Hadoop vendors. And in terms of Hadoop distribution market share and market valuation, the below figure will give you enough details. This was all about the top Hadoop distributions available in the market for Hadoop. I hope you got a clear understanding of the Hadoop vendors. 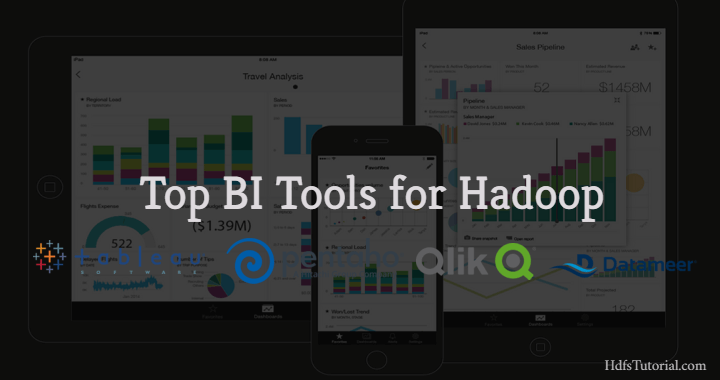 Although the list is just not limited to the above 5 best Hadoop distribution providers. Many big companies are trying to get into this segment and making their ways. I would like to mention few of those here. I hope very soon we will have some more Hadoop vendors with some amazing features available. I would like to know which Hadoop distribution you use. These are some of the top Hadoop distributions available in the market. Cloudera, HortonWorks along with mapR is leading the industry with many other companies trying to make an impact.